It takes time to create a master plan for anything. Especially when there are 32 Minneapolis neighborhood parks, three regional park and trail areas, six community and neighborhood recreation centers, and the possibility of creating new parks, lands and land connections. 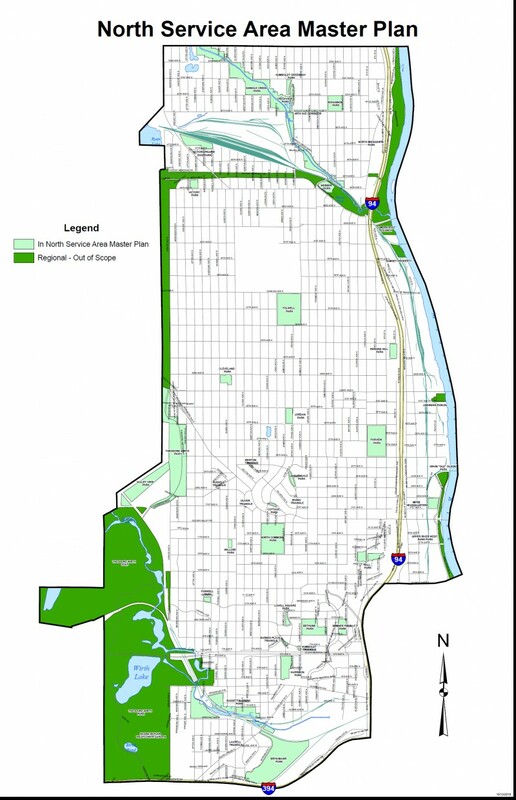 The North Service Area of the Minneapolis Park and Recreation Board (MPRB) stretches from the northern and western city limits south to I-394, and east to the Mississippi River. It stretches from the northern and western city limits south to I-394, and east to the Mississippi River. The North Service Area Master Plan will take a comprehensive look at each park asset within the North Service Area; set a vision for operations, management, programming and capital improvement; and create a master plan for each non-regional park within the service area. Specifically the master plan will include: characterization of the service area, demographics, recreational needs, current park service, projected change, etc. ; condition assessment of all parks and exterior park amenities (excluding golf courses and regional parks), including development of a template that can be used as a standard across the entire system; and lastly a park and recreation needs assessment. It will also work to determine a systematic approach to the service delivery across the area, programming and operational models for each park, and develop general plans for outdoor facilities in each park. All this work will include the amenities, phasing and budget. As part of this effort the MPRB established a Citizen Advisory Committee (CAC) made up of local residents and Council appointees to begin the process of looking at the North Service Area Master Plan. Their scope was to take into account existing activity plans (urban agriculture, court sports, skate parks, etc.) and system planning (ecological system plan, comprehensive plan, etc.). The project is nearing the end of its four-phase plan. The Phase I Project start up began in late 2016 into March of 2017. The Phase 2 Vision & Discovery went from March to August 2017, where staff worked closely with the project team and advisory committees, and hired consultants to research, assess, map, and begin to understand park and recreation needs across the North Service Area. Phase 3 Park Planning runs August 2017 to January 2018 and is in the midst of working with staff, advisory committees, project team and consultants to initiate master planning for the service area as a whole and for individual parks within the service area. This phase has involved going out to over 100 community events to gather info, and the CAC has also initiated “Work Groups” that are offering even more opportunities for gathering more input for this important and large effort. Phase 4 Master Plan Approval in 2018 comes after still further input from all advisory groups, consultants and plan partners to finalize the master plan recommendations, which will include a public comment period. Work Groups began in November and December, and there are several subgroups working on the North Service Area Master planning effort. Each has an area of focus for the planning effort. There is a Work Group discussing “Parks Without Recreation Centers” whose purpose is to develop design principles for parks without recreation centers and ensure they are not forgotten in the overall planning process. One is for the North Commons whose purpose is to consider the future of North Commons Park. The Shingle Creek Work Group’s purpose is to consider design ideas for parkland along Shingle Creek, including Creekview Park, Shingle Creek Park, and trails between Webber Park and the northern city limit. Lastly, there is a Work Group for Bassett Creek Valley whose purpose is to consider connections between and design of the parks along Bassett’s Creek in the Bryn Mawr and Harrison neighborhoods. The Victory neighborhood also had a presentation in December by MPRB’s Colleen O’Dell, and out of that presentation further data was collected from residents. Among the final phases and most exciting of this North Service Master Planning is for the MPRB to host some Charettes (mini planning sessions) with planning experts from outside the area who have expertise in designing other areas across the country like North Minneapolis with its diverse population and needs. They will design some concepts which will again be brought out to residents for final consideration, and then brought back to the CAC, and finally to the MPRB Board for final approval and adoption. It seems like a lot to get done by March 2018. For info check the MPRB website minneapolisparks.org/park_care__improvements/park_projects/current_projects/north_service_area_master_plan/. For more details or questions contact MPRB Adam Ardvison at 612-230-6470 or aarvidson@minneapolisparks.org. Previous Previous post: Holiday on 44th – a Camden Holiday tradition!